Home / Alexandre Lacazette / Ed Woodward / Football / goals / ligue 1 / lyon / Man United / MUFC / review / saviour / striker / world class / Alexandre Lacazette, The Man United Saviour! Alexandre Lacazette, The Man United Saviour! In world football, signing an already established world class striker is a bit of a challenge. The biggest worry when signing a world class proven striker is that they suffer a monumental fall from grace which happens more often than not. Fernando Torres, Andrei Shevchenko, Radamel Falcao to name but a few that have made the move at the peak of their careers and flopped harder than a Teenage Mutant Ninja Turtle pizza slice! The best way to go about buying a potential world class striker, is going out and finding a striker that needs a bigger platform to showcase himself on the world stage. This may seem like a difficult task but if I can find one by merely watching football across Europe from the space of my own living room, then I am pretty sure an extensive network of scouts should have no problemo. Over the past few seasons a young french talent has emerged from the depths of Lyons youth academy. Standing at 5"9, Lacazette isn't the tallest of players but his technique on the ball combined with his pace and ability to beat a man has meant that in his earlier years he was played on the wings or as more of a wide forward. This limited his goalscoring opportunities, but over the last 2 seasons he has primarily been used as a striker by Lyon. The type of return that Lyon received with having faith and using Lacazette as their main striker was evident when he finished the 13/14 campaign with 20 goals in 42 domestic appearances. This would provide the building block Lacazette needed to really test himself and see how far he can push himself to become a top striker. At the start of the 14/15 season, Alexandre Lacazette - then a 23 year old striker - managed to hit 8 goals in the first 10 games of the season. This set the foundations for Lyon to make a strong title challenge against the oil money might of PSG. Sadly for Lyon, they ended the 14/15 season trophy-less and 8 points adrift of PSG. Lacazette, on the other hand, managed to scoop all the domestic awards that France (Ligue 1) had to offer. Lacazette in 14/15 scored a mammoth 30 goals in 36 appearances and was crowned Ligue 1 Player of the year, Ligue 1 Top Goalscorer and earned a place in the Ligue 1 team of the year. Let us not forget this is a Ligue 1 that contains a certain Zlatan Ibrahimovic! Lacazette has the talent to make it as one of the best strikers in the world. His game focuses on his technique which allows him to beat a man with skill as he may throw in a lollipop and a drop of the shoulder to gain that inch on a defender but if you give him an inch, he will certainly take a mile! The blistering pace which he possesses compliments his off the ball movement, meaning if he has someone on his team that can pick out a pass, he will offer himself with his movement to get in and behind. At Manchester United, they have a plethora of talent available to offer Lacazette the service he will need. With Rooney playing as the #10, there will be plenty of space for Lacazette to run into as the defenders will get drawn out toward Rooney, Depay and Mata. I feel the time is right for Lacazette to step up to the most physically demanding league in the world. He needs a bigger platform to showcase his talent, we saw it with past legends that were at the same level that Lacazette is at now, where they have accomplished everything at a "lesser" league and need a bigger platform to show the world what they are capable of. Not just limited to Man United players but Ruud Van Nistelrooij, Diego Costa, Jimmy Floyd Hasselbaink, Dennis Bergkamp, Sergio Aguero, Eden Hazard etc. There are too many to name them all but they all conquered their own respective leagues and needed a bigger challenge and they came to the Premier League and were successful! 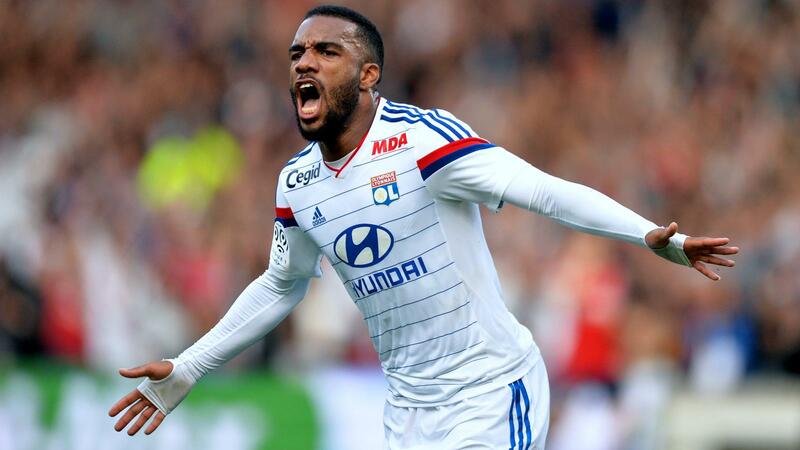 At 24 years old, Lacazette is surely the next big thing in world football and he would not cost more than £35 Million. Ed Woodward, go get him! No player review is complete without a YouTube compilation. Enjoy!